Discover the complete details for open liens, including assignments, releases and subordinations. Also learn tax status and assessment details, plus current ownership and vesting of a property. Choose this report for a complete review of open mortgages, tax status, ownership and vesting of a property. Discover mortgage position, subordinations, assignments and releases. 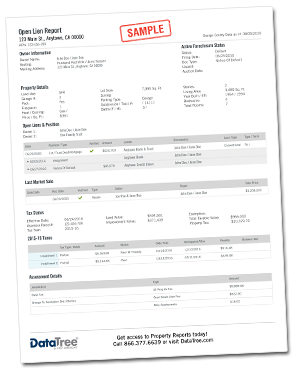 Also learn tax status, with real-time tax where available, plus assessment details. Lastly, get ownership and vesting information, last market sale, foreclosure status and basic property details.